Ceri Richards was a British artist that always tried out different types of painting during his career. 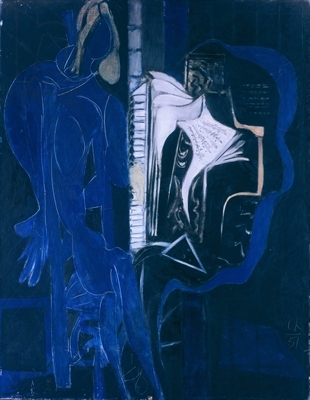 From 1930 on, he became interested for the automatic technique and the use of random of the surrealists (although I think that his works are much more influenced by cubism than by surrealism). A decade later, his paintings started to reflect his passion for music, especially for Beethoven; and for feminine figures. Ebony and blue shows us two women, possibly sit. The one in the right holds a score and a triangle. The composition is divided vertically in two by a stripe which refers to a piano. Despite that the works of the artist generally have a colorful palette, Ebony and blue is almost monochromatic, and the figures are only guessed by light brushstrokes of white. ~ by Álvaro Mazzino on May 26, 2011. Hi, Neat post. There’s an issue along with your site in web explorer, would test this? IE nonetheless is the market chief and a big component of people will omit your great writing due to this problem. Dr Snooze is really a great resource for more specifics of bed frames and train track Florida. of bed frames and train track Florida. Riser recliner chairs are best for those with limited mobility, or who spend a lot of time within an armchair. The hitch ball have to be elevated across the truckbed to ensure people to fasten trailers in it. mobility, or who spend a lot of time within an armchair. The hitch ball have to be elevated across the truckbed to ensure people to fasten trailers in it. These will be the issues that you simply simply must keep at heart while you plan on choosing and getting video game systems. be something of a curse. This entry was posted on May 26, 2011 at 17:16 and is filed under Cubism, Surrealism.You can follow any responses to this entry through the RSS 2.0 feed.You can leave a response, or trackback from your own site.